Sri Lanka can achieve the US$ 1 billion gem and jewellery export revenue by 2020, provided the right policy framework is in place along with the lifting of the 14% tax on net profit on the sale of gems and jewellery, National Gem and Jewellery Association officials said. While also expressing concerns over why the Nation Building Tax (NBT) on gem imports has not yet been removed. “Since 1979, this industry has had a tax exemption for all foreign currency sales for direct and indirect exports. At one time the industry reached USD 500 million in exports. We are hopefully awaiting a positive response from the Government to withdraw the tax,” they said. Industry officials also expressed concern over the calculation of the cost of gems, noting that over the centuries the industry has been operating with minimal documentation as most of the trade was done on trust. “We can’t calculate the cost in a way that is acceptable to the tax authority. Even they are not sure how to calculate it. You should be able to present documents to the tax authority but most of the time we do not possess them due to the nature of the industry”, they noted. Moreover, they said the Government either had to decide whether they want an increase in export revenue or whether they want an increase in income tax. They said achieving both was not possible, the moment you start collecting taxes, the country will only lose its export income from the industry, they added. The Association further noted that the removal of the NBT of 2% as proposed in the Budget has not yet come into effect. They said even though Budget 2018 is operational from April, the Customs Department refused to lift the tax citing various reasons. Officials also called for more Industry representation on the National Gem and Jewellery Authority (NGJA) Board, as industry-related matters could be discussed and solved. “Currently there is no industry representative on this Board comprising 10 to 12 members. According to the NGJA Act, upto five industry representatives can be appointed to the Board. However, this has not yet happened and we have not got a fair representation at the moment”, they added. 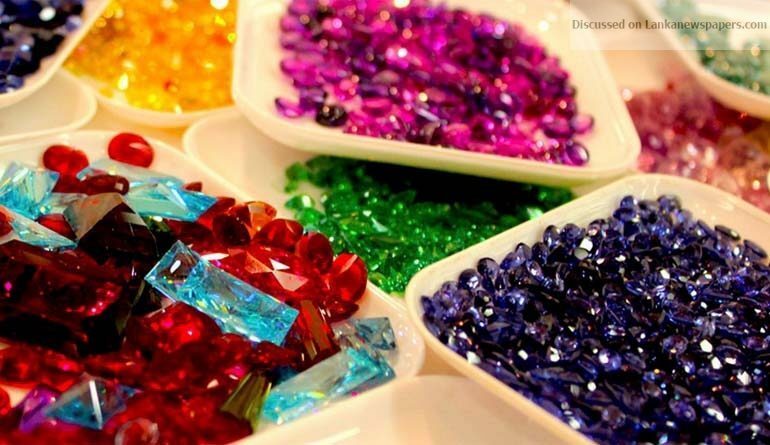 According to the Association there is a huge potential of online trading of gems and jewellery. However, they noted that with the current procedure and charges, it was not viable. They said it was critical that the Government facilitated online trading and targeted world markets. Speaking of the 15% tax on gold imports officials said, that the situation will only pave way for further ‘grey’ market operations in the country and increase smuggling of gold into the country. While acknowledging the Government’s concerns over increasing gold imports and the loss of foreign exchange, they noted that the tax will only increase the price of jewellery and gems, reducing the industry’s competitive edge. “We are hoping that the Government’s decision will be a win- win situation, at least for gold manufacturers and for legitimate exporters”, they said.